Dzogchen Khenpo Choga Rinpoche has declared 2012 to be "The Year of the Dakini." As you may know, Dakinis are the root of all virtuous activity. Dakinis also represent the inner aspect of sangha, which is the positive thinking of our community members, and more broadly, the positive thinking of all other beings too. Keeping this in mind, the Dzogchen Shri Singha Foundation is proud to announce our many upcoming 2012 events and activities taking place at the Dzogchen Retreat Center. The first month of the Internship is also the 2012 Buddha Path Retreat (for Chinese and English Speakers) a multi-national gathering of the international students of Dzogchen Khenpo Choga Rinpoche. If you are considering attending the first month of this retreat, it is required that prior to attending, you complete at least one seasonal retreat within the Dzogchen Lineage. If this applies to you, then note that there is a $100 discount applied to your Internship fee if you attend the Spring or Summer retreat this year. Let the director know if you can't meet this requirement, and as an alternative way of meeting the prerequisite, she can set you up to be tutored by a graduate of a prior Internship. During the 2011 Dzogchen Internship and Buddha Path Retreat. Photo montage by Bhadra. The full three-month program is intended only for internship graduates of prior Dzogchen Lineage Internships. This internship is intended for those who sincerely want to become Dzogchen Lineage teachers, benefit others, and realize wisdom and compassion in this lifetime. It is for students who have faith in the Dzogchen Lineage, and who understand that progress in Dharma, the root of happiness, requires comprehensive training and continuous diligence in the three techniques: learning, contemplation, and meditation. Please join us for the Dzogchen Lineage Spring Retreat at the beautiful Dzogchen Retreat Center near Eugene. The curriculum includes in-depth teaching on the fundamental principles of Buddhism as presented in Dzogchen Khenpo Choga Rinpoche’s practice text, The Buddha Path. This program's engaging approach is designed to give students real-world skills for coping with the stressors of modern life by laying a solid foundation for dharma practice, on and off the cushion. Erik in the Mandala Garden at the DRC. Photo by Bettina M. Gordon. 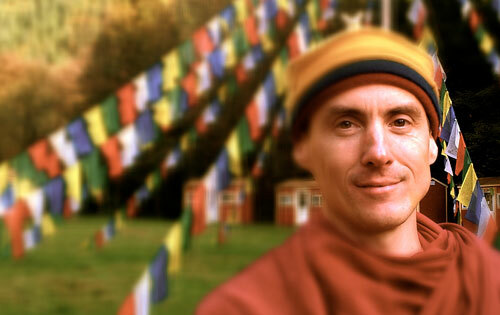 Erik Jung is a monk and an authorized Dharma Teacher under the guidance of Dzogchen Khenpo Choga Rinpoche. 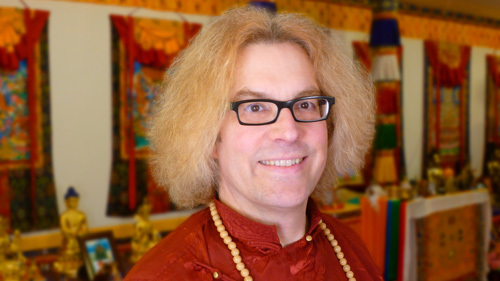 Erik, a lifelong Buddhist practitioner, has spent more than eight years studying closely with Khenpo Choga Rinpoche. He is a passionate and inspiring teacher in the Dzogchen Longchen Nyingthig Lineage of Mahayana Buddhism. Please join us for the Dzogchen Lineage Summer Retreat at the beautiful Dzogchen Retreat Center near Eugene. The curriculum includes in-depth teachings on Dzogchen Khenpo Choga Rinpoche’s practice text The Buddha Path, with a special emphasis on developing joy through the musical aspects of practice, including performing as a group, chanting, mantra recitation, playing instruments, composing, and doha (spontaneous musical expression). Hazlitt in the Dzogchen Mandala Shrine at the DRC. Hazlitt (Pema Bhadra Dorje) is an authorized Dharma Teacher under the guidance of Dzogchen Khenpo Choga Rinpoche. Hazlitt has studied with Rinpoche for ten years, accumulating over 21 residential retreats and three long-term internships. Beginning in October 2009, Hazlitt embarked on a North American teaching tour covering 25,000 miles and giving over 320 public teachings. Hazlitt is also a singer-songwriter who composes and performs Dharma-inspired music. Please join us at the Dzogchen Retreat Center for our program of four weekend retreats. You are encouraged to attend all four, but you may attend for as little as one day or you can extend your stay beyond the abovementioned dates. Spring and early summer are our busy season here at the DRC, and we need "all hands on deck" to get everything shipshape for the Internship and the many other retreats on our schedule this year. Everyone participating will be here as a volunteer. We're keeping the prices of these four retreats very affordable at only $20 per day plus optional dana to the teachers. Although most of your time will be invested in Dharma activities such as making progress on our many maintenance and improvement projects, you will also participate in group morning and evening sessions, practicing from an early draft of the third edition of The Buddha Path by H.E. Dzogchen Khenpo Choga Rinpoche. There will also be one teaching session and Dharma discussion each Saturday and Sunday, led by one or more Bodhisattvas authorized to teach by Khen Rinpoche. The curriculum for the four weekend retreats is inspired by the Four Immeasurables. A beautiful little book with excerpts of teachings from the Dzogchen Lineage Masters about the Four Immeasurables will be available to help you deepen your contemplation during your retreat. The Rinpoches with the Dzogchen Bodhisattvas of the first graduating class of 2008. Dzogchen Khenpo Choga Rinpoche has authorized and encouraged the Dzogchen Bodhisattvas to offer Sutrayana and Mahayana Buddhist teachings around the world. Some of the Dzogchen Bodhisattvas who may be participating in the weekend panel teachings include Orgyen Zangpo (Kunzang), Dr. Shannon Young, Sean David Young, Hazlitt Krog, John Sullard, and others to be announced. Click here to forward this newsletter to one or more friends! Dzogchen Shri Singha Foundation USA, Inc.
...and other contributors as may or may not be mentioned above in the newsletter. Thank you everyone for your contributions! Future contributors are encouraged to JOIN OUR TEAM! If you feel you received this message in error or you wish to be removed from this mailing list, you can unsubscribe with one click here. To subscribe, please fill out the Dzogchen Lineage sign-up form and add dzogchenlineage@gmail.com to your address book to help ensure proper delivery.